THE TALMUD BLOG: Review of Elizabeth Shanks Alexander, ‘Gender and Timebound Commandments in Judaism’- Guest Post by Raphael Magarik. Yet, while Alexander conceived the idea for the book, as she explains in the introduction, “in the shadow of a contemporary cultural debate,” she writes as a Talmudist. Thus, she restricts herself historically to pre-Medieval sources and methodologically to descriptive history. Further, within those frameworks, Alexander does not so much answer as destroy the original question. CHRISTOPHER ROLLSTON IN BIBLE AND INTERPRETATION: By God I am King: David’s Rise to the Throne in Broader Context. The epigraphic texts from the ancient Near East, therefore, paint for us a broader picture, they reveal more of the depth of the tapestry that is the world of the ancient Near East. And the epigraphic texts remind us that ancient Israel was part of the ancient Near Eastern world. This essay will be useful when I lecture on the United Monarchy in my first-year Intro to Hebrew Bible this semester. THIS WEEK'S DAF YOMI COLUMN BY ADAM KIRSCH IN TABLET: When Talmud Is the Focus of Jewish Observance, Theology Comes to Life. Instead of asking us to passively agree with the rabbis, oral law engages the intellect in concrete problems of logic and interpretation. My article, "Ritual in the Hekhalot Literature," is included in the volume. I'VE BEEN COLLECTING bad-news articles and blog posts on the Middle East for the last couple of weeks. Sadly, they all remain relevant. War Threatens Palmyra, UNESCO Pleads for Syrian Heritage Protection (Magda Abu-Fadil, Huffington Post). Background on Palmyra and its inscriptions is here and links. More on Palmyra in this war is here and here. Syria's Rich Archaeological Treasures Imperiled by Civil War (Tia Ghose, Live Science). Arms for Antiquities: Syrian Artifact Smuggling Bleeds Sites Dry - including Dura Europos (Joanne Bajjaly, Al-Akhbar). Background here and links. Ma'loula Under Attack (Steve Caruso, The Aramaic Blog). Background on Ma'loula (Maaloula, Malula) is here with many links. Pictures: Looters Shatter Museum of Ancient Egyptian Treasures (National Geographic). Egypt demands return of stolen artifacts from Europe and U.S. (Afrik News). For some reason someone decided that this was a good time to re-release this 2009 article. UPDATE: Accidentally left this one out: Mount Sinai monastery latest victim of Egypt's upheavals. Closure of St Catherine's monastery due to security concerns has devastated tourist trade of nearby town named after it (Patrick Kingsley and Marwa Awad, The Guardian). St. Catherine's Monastery and its manuscripts have been mentioned often at PaleoJudaica, for example, here, here, here, here, and here. DOCUMENTARY FAIL: Simon Schama's misreading of Paul (NT Blog). Background on the documentary The Story of the Jews is here and links. On 28 August, 2013, Dr. Jon Taylor, Assistant Keeper of Cuneiform Collections at the British Museum gave a talk: “Hormuzd Rassam and the Discovery of the Cyrus Cylinder” to a packed audience at Cal (UC Berkeley). The talk was presented by the Assyrian Heritage Fund and co-sponsored by the Center for the Middle Eastern Studies and the Townsend Center for Humanities. Among the attendees was the elderly great, great, great grandson of one of the brothers of Rassam who had traveled just for the occasion. To prepare for the talk, Dr. Taylor had resorted to archival research in the vast acquisition registers of the British Museum. Thumbing through old records at the museum, he found out (rather unexpectedly) that the cylinder (identified later as the “Cyrus Cylinder” by the Assyriologists the British Museum) was listed as “unbroken” in boring bureaucratic documents, leading him to speculate that the cylinder was most likely broken (perhaps intentionally) before it was shipped to London. Intense western interest in eastern biblical lands and peoples in the 19th century did not just lead to spectacular discoveries of ancient civilizations, it sparked a lively global trade in ancient artifacts procured in a “don’t ask, don’t tell” manner. Since 1850s illicit diggings for antiquities that institutions and individuals are willing to pay good money for have progressed in the Middle East without any sign of decline. Local laborers usually got paid literally pennies for each inscribed tablet they dug up, so it was not unusual for them or actually anyone in the antiquities supply-chain to break clay tablets they found into pieces to increase their meager pay and sell the “surplus” to Baghdad dealers. Dr. Taylor prepared a list of the usual suspects who had access and motive to break the unbroken cylinder, and like a clever crime novel detective eliminated all but two, one of them Daud (Fat) Toma, one of overseers Rassam had hired—not deemed trustworthy even by Rassam himself. We would never know without a shadow of a doubt, but we can safely say that the real culprit was the insatiable black market for antiquities. For much more on the Cyrus Cylinder, see here and links. LIVESCIENCE: Animal sacrifice at temple powered ancient Jerusalem's economy: Animal bones found in a dump dating to the end of the second Temple period suggest that animal sacrifice powered Jerusalem's economy. The finding, published in the September issue of the Journal of Archaeological Science, confirms visions of the temple depicted in historical Jewish texts and suggests the economic heart of the city was its slaughtering operation. You can find the original journal article here (#22) (noted by Joseph Lauer). On the Temple as a "massive slaughterhouse," see also here. TEMPLE MOUNT WATCH: Gold treasure trove unearthed at base of Temple Mount: Byzantine-era coins and unique menorah medallion found by Hebrew University archaeologists at site abutting Southern Wall (Ilan Ben Zion, Times of Israel). It must be nice to find gold often enough to be able to say that. Follow the link for cool photos. JARED CALAWAY'S NEW BOOK: Sabbath and Sanctuary Available! SYRIAC WATCH: Levita Meets the Maronites (Ed Cook). SYRIAC WATCH: Peshitta (Aramico blog). 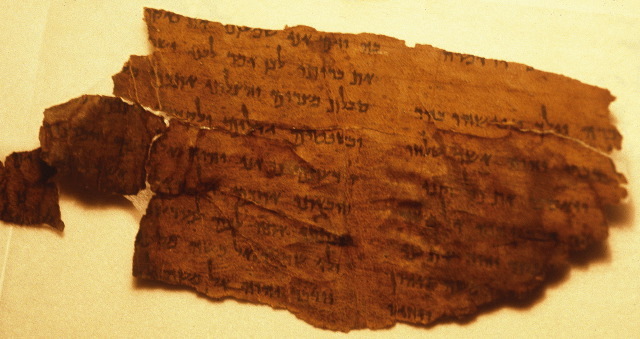 The purpose of this page is to concentrate in one place, resources found on the internet that relate to the Aramaic Bible in his best-known version, the Peshitta. Most links are to posts on the blog, with details about the edition and links for viewing and downloading. This page will be continually updated.